Graduating students must arrive at the scheduled line-up time in order to check in. The academic lines will form by degree level and depart for the ceremony promptly based on the marching time listed. Students and guests should allow extra travel time due to traffic, parking, and potentially inclement weather. If you are an online or off campus student and will be attending the commencement ceremony, you may contact the EKU Barnes & Noble Bookstore to purchase your cap and gown and have it mailed to you. Please contact the bookstore at 859-622-2696 to arrange for them to mail your regalia (an additional shipping charge will apply). The bookstore will have a limited supply of regalia available in Alumni Coliseum at the ceremonies for purchase. If you have any questions or concerns, you may contact us at graduation@eku.edu for assistance. Family members and friends who are unable to attend EKU's Commencement or College Convocations may view the ceremony via the Internet. 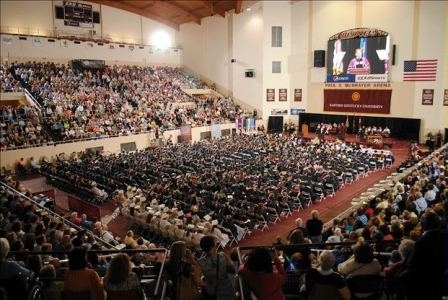 A link to the live stream will be available at www.eku.edu on the day of Commencement.